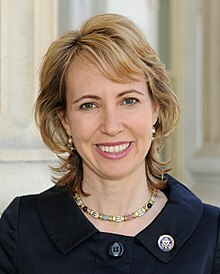 Gabrielle Dee "Gabby" Giffords (born 8 June 1970) is a retired American politician from the U.S. state of Arizona. As a Democratic member of the United States House of Representatives, she represented Arizona's 8th congressional district from 2007 until her resignation on January 25, 2012, having been elected to Congress three different times. She is a founder of Americans for Responsible Solutions, which focuses on gun violence. On her political positions during campaign — Stephanie Innes (August 11, 2009). "Giffords: Too soon to settle on a plan for health care". The Arizona Daily Star (Arizona): p. A1. Comment after winning re-election — Bill Hess (November 6, 2010). "Giffords wins re-election to U.S. House; Kelly says voters have spoken". Sierra Vista Herald (Arizona). Discussing being "targeted" by Sarah Palin, in March 2010 interview with MSNBC — Jonathan Alter (January 10, 2011). "Can Obama Turn Tragedy Into Triumph?". Newsweek (Harman Newsweek LLC). Retrieved on 2011-01-10. After experiencing vandalism directed at her congressional office in 2010 — Ben Quinn and Paul Gallagher (January 9, 2011). "US congresswoman Gabrielle Giffords shot as six die in Arizona massacre". The Guardian (Guardian News and Media Limited). Retrieved on 2010-01-10. A Senate in the Gun Lobby’s Grip. The New York Times (April 17, 2013). Retrieved on 2013-04-18. Giffords, an avid supporter of sin and baby-killing, was shot for that mischief. ~ Fred Waldron Phelps, Sr.
President of the United States Barack Obama — Lee, Jesse (January 8, 2011). "The President Speaks on the Shootings in Tucson: "We Are Going to Get to the Bottom of This, and We’re Going to Get Through This"". The White House Blog (www.whitehouse.gov). Retrieved on 2011-01-10. Minority Leader of the United States House of Representatives Nancy Pelosi — "Pelosi Statement on Shooting Involving Congresswoman Giffords". Congresswoman Nancy Pelosi (pelosi.house.gov). January 8, 2011. Retrieved on 2011-01-10. Speaker of the United States House of Representatives John Boehner — "Remarks: Speaker Boehner Addresses Tragic Shooting in Arizona". Speaker of the House John Boehner (speaker.house.gov). January 9, 2011. Retrieved on 2011-01-10. Astronaut and brother-in-law Scott J. Kelly — "Astronaut Husband of Rep. Gabrielle Giffords: There's 'Little That We Can Do But Pray'". SPACE.com (www.space.com). January 10, 2011. Retrieved on 2011-01-10. Peter M. Rhee, trauma chief of the University Medical Center at Tucson — "Doctor: Giffords has '101 percent chance' of surviving". MSNBC. January 11, 2011. Retrieved on 2011-01-12. At first I thought she was trying to strangle me … It was miraculous. Husband Mark E. Kelly, on Giffords opening her eyes while recovering from the 2011 Tucson shooting — Gupta, Sanjay (January 14, 2011). "Tucson: Heroes amidst the horror". CNN. Retrieved on 2011-01-14. Gabby's got a long road ahead of her. We know that the recovery from these [kinds] of injuries isn't measured in days and weeks. It's more like weeks and months. … But, you know, she's a really, really tough woman. Mark E. Kelly, on Giffords' ongoing recovery from the 2011 Tucson shooting — "Kelly: Injured Giffords cares for others". United Press International. January 17, 2011. Retrieved on 2011-01-17. 22-year-old Jared Loughner opened fire outside a Tucson, Arizona grocery store, shooting Congresswoman Gabrielle Giffords, Federal Judge John M. Roll, and sixteen others. At least six are dead and counting. Congress passed three laws against Westboro Baptist Church. Congresswoman Giffords, an avid supporter of sin and baby-killing, was shot for that mischief. A federal judge in Baltimore, part of the massive military community in Maryland and in the District of Columbia, put Westboro Baptist Church on trial for faithful words from God. Federal Judge Roll paid for those sins with his life. Today, mouthy witch Sarah Palin had Representative Giffords in her crosshairs on her website. She quick took it down, however, because she is a cowardly brute like the rest of you. The crosshairs to worry about are God's and he's put you in his and your destruction is upon you. You should have obeyed. This nation of violent murderers is in full rebellion against God. God avenged himself on you today by a marvelous work in Tucson. He sits in the heavens and laughs at you in your affliction. Westboro Baptist Church prays for more shooters, more violent veterans, and more dead. Praise God for his righteous judgements in this Earth. Amen. Fred Phelps, pastor of Westboro Baptist Church. — "Westboro Baptist Church To Picket Christina Green’s Funeral". Anorak News. January 10, 2011. Retrieved on 2011-01-12. Chip Berlet on "The Becking of Gabrielle Giffords" - video report by Democracy Now!